Changes are coming to Around the Horn - but the points still don't matter, and the scoring still doesn't make sense. Starting November 5th, Around the Horn is going to be looking much different on ESPN. The show will be moving to ESPN’s New York studios (home to First Take and Get Up, among other shows) and will be launching new graphics, new music, and will begin to include augmented reality into the show. 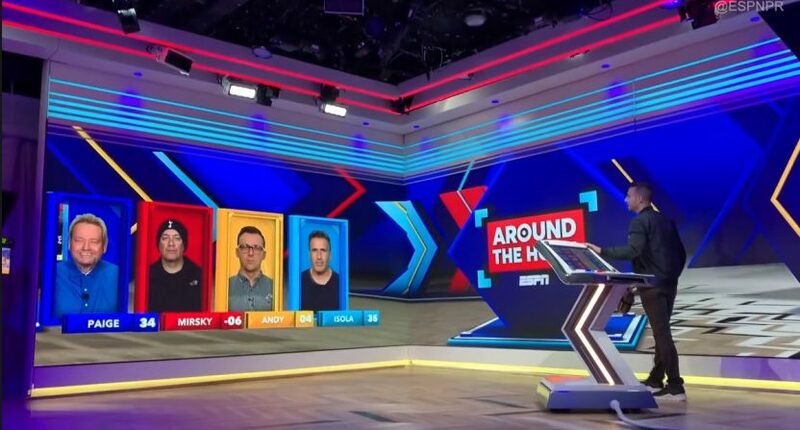 Here’s a clip from ESPN about the new Around the Horn, which shows off some of the new augmented reality technology they’ll be using. The augmented reality stuff sounds a bit ambitious, but seems like it could work out pretty well for a show like ATH. This explanation of how it will be used, complete with a hilarious quote from Reali, sounds promising. As the show progresses from its opening First Word segment through its signature Showdown and Facetime ending, the panelists’ images will appear in-studio with Reali and can be enlarged, shrunk, isolated and more. In addition, the higher scoring panelists who advance through the daily competition will transition forward closer to Reali. From his touchscreen controls, Reali will continue to mute and award – or take away – points, while now having the ability to use new social media-inspired filters to react to the arguments made by the panel. And here’s the new theme, which sounds…well, a bit less “fun” than the current theme. The network is also releasing a second-screen experience for ATH, which includes stats from the show’s history and the Behind the Horn clips that populate the show’s Twitter account. The changes have been in the works for awhile, reports John Ourand of the Sports Business Journal, who talked to ESPN Production’s senior director of original content Alex Tyner about the new look for ATH, but the augmented reality technology wasn’t sophisticated enough at the time talks began. Around the Horn has avoided major changes during much of its time on the air. The format has remained relatively consistent – a host and four guests talk about the sports topics of the day, scoring points on an arbitrary basis that don’t matter, and whoever the winner is at the end of the half hour get some time to talk about whatever they want. Adding new augmented reality technology theoretically won’t change the show’s core formatting, but it might make things seem a bit fresher going forward.